Hundreds of Elementary Students Expected to Participate in Flag Day Ceremony Oswego, N.Y. - Official observation of the national Flag Day holiday will take place Thursday, June 14 at 10 a.m. at Fort Ontario State Historic Site. Nearly 1,000 third, fourth and fifth grade school students from central New York will participate in ceremonies commemorating the adoption of the Stars and Stripes as the official flag of the United States of America on June 14,1777. The Fort Ontario Flag Day event will feature a recreation of the British turning Fort Ontario over to the United States in 1796, a hands-on history of the origin of the American flag by the Oswego Elks Club with students participating, a history of flags that flew at Fort Ontario by AmeriCorps volunteers, living history and musket demonstrations by members of the Continental Arms Collectors Association, historic games, and self-guided tours of the fort. Fort Ontario Superintendent Paul Lear will provide historic background about the site, which was the scene of two French and Indian War battles and two War of 1812 battles. The fort will be open to the public during the Flag Day event. Regular admission prices will be charged. School groups must register in advance to participate. To register, e-mail imumpton@gmail.com. "This year marks the beginning of the Bicentennial of the War of 1812, a war in which New York State and Oswego played a prominent role," said Lear. "Warehouses were built at Oswego during the war to store vast amounts of vital military supplies and equipment forwarded to military operations along the Niagara frontier and Sacket&apos;s Harbor." During the War of 1812, Fort Ontario guarded the supplies stored at and moving through Oswego; one British attack on Oswego in 1813 was driven off. In May 1814 a larger and more powerful British fleet, intent on crippling American ship construction at Sacket&apos;s Harbor, took Fort Ontario after a two-day amphibious assault. 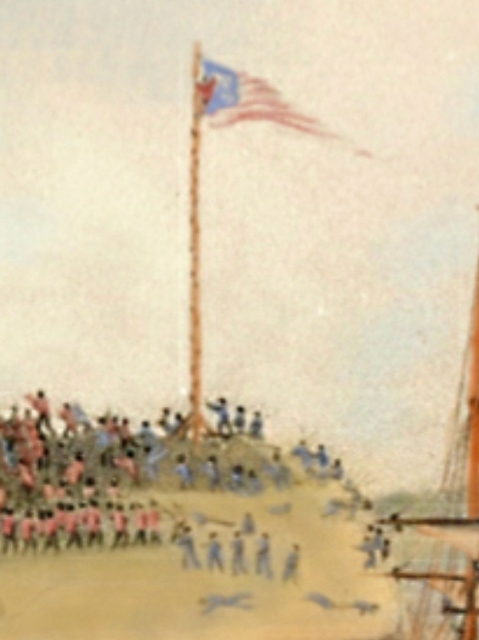 The 1814 Battle of Oswego-Fort Ontario ended with a stubborn defense of the American flag which had been nailed to the flagpole; today this flag resides in the ancestral castle of the British land commander during the battle. The 444th Engineer Company, 479th Engineer Battalion, U.S. Army Reserve, now deployed to Afghanistan, maintains a reserve center on the old Fort Ontario Military Reservation. "They proudly carry on a 257-year history of military occupation of the old army post," said Lear. "A Corps of Engineers and US flag carried with the 444th during their 2007-08 service in Iraq will be displayed at the fort during the Flag Day event." Fort Ontario State Historic Site is located at the north end of East Fourth Street in the City of Oswego. For more information on Fort Ontario visit the websites www.fortontario.com and www.nysparks.com. For visitor information, call the Oswego County Tourism Office at 1-800-248-4FUN (4386) or go to http://www.visitoswegocounty.com/.